Cuban composer Leo Brouwer (b. 1939) no doubt could be considered by many as Modern music's most important living composer for the classical guitar. His long life has been studded with compositional stars that will ensure him a place in the classical guitar pantheon. And with that in mind I introduce today's album for you, happy to have it playing as I write this. 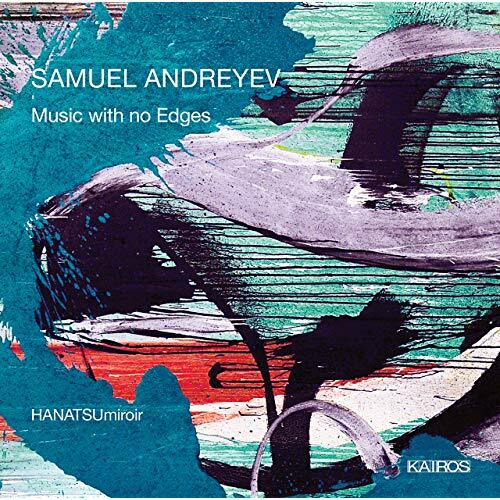 It is an album of Brouwer compositions for solo guitar. It is called Hika and the Young Composer (Brilliant 95838), a program that features the fine performances of guitarist Frederic Zigante. 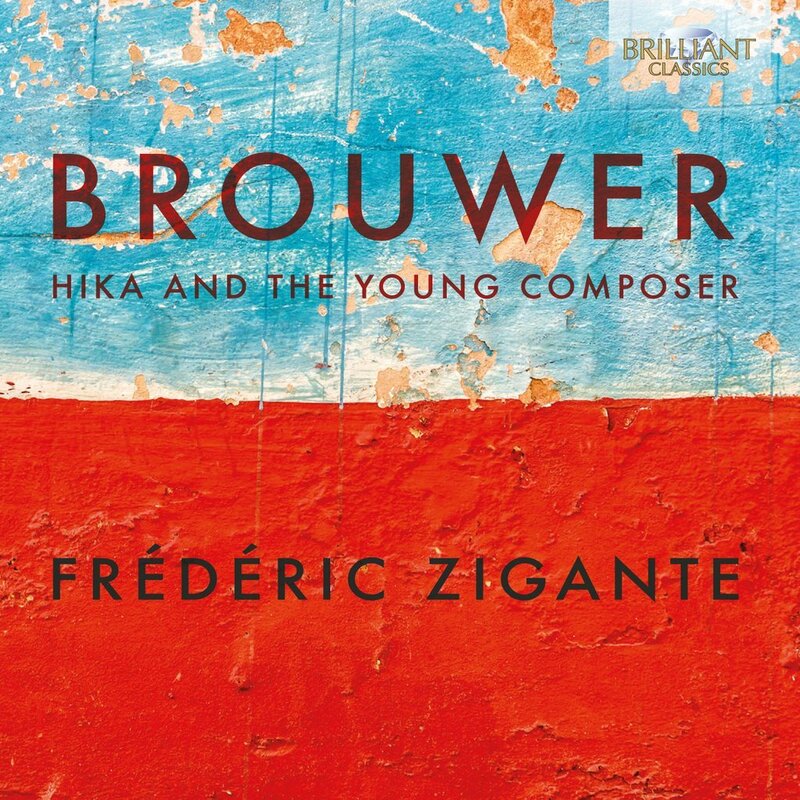 We get to hear a well selected program of solo guitar miniatures by Brouwer that cover his early period as a composer and then too some works that share in the outlook of the first important works yet came from the pencil of the composer at a somewhat later date. So we get some wonderful items to savor. There is the title piece "Hiko" (1996) noting the passing of Toru Takemitsu, along with 20 exemplary "Estudios Sencillos" spanning the time period of 1961 to 1984. Some extraordinary miniature staples of his early period round out the program, including the 1959 "Tres Apuntes," "Fuga No. 1" from 1957, two "Elogio de la Danza" from 1964, and lastly the 1956 "Danza caracteristica." What is so remarkable listening to this program is the richness of vocabulary, the very prime Cuban rooted idiomatic way the guitar is sounded and yet too the unmistakable Modernity of it all. It is hard to imagine a better mix of substance and excitement, to the triumph of heart, mind and fingers over the frustratingly inert "thereness" of the guitar sitting on its stand, waiting for the player to express a dominion, brilliance and imagination. These pieces and their performances mark a triumph of humanity over wood, string and perhaps a bit of ivory or other fast-staying substance. Humanity wins and yet too we cannot help being glad for the guitar, of course! For the guitar wins, too. 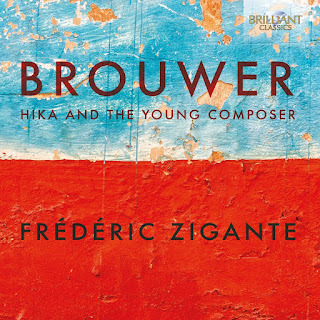 It is an excellent album and for the Brilliant price I surely recommend this one to everybody and anybody who wishes to explore Brouwer's extraordinary rootedness and why the guitar is a wonderful thing in the hands of Frederic Zigante. Hurrah! Here in real time yesterday marked the birthday of Charlie Chaplin. Most everyone knows and probably loves Charlie Chaplin's movies. Perhaps less of us know that he was a prolific songwriter, with scores of them. Most (at least those as old as I am) recognize the song "Smile," but how many know that it was one of Charlie's songs? It was. 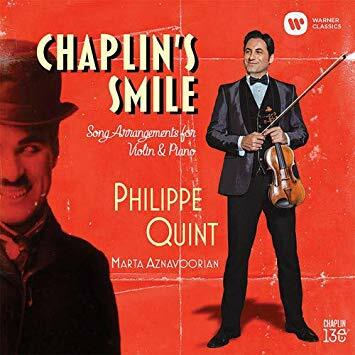 Violinist Philippe Quint gives us a happy and revealing program of Chaplin's love songs on an album entitled Chaplin's Smile (Warner Classics 2-585381). He and pianist Marta Aznavoorian, with the help of Charles Coleman, put these violin-piano arrangements in order and the two artists work in delightful tandem together throughout in realizing them for us. 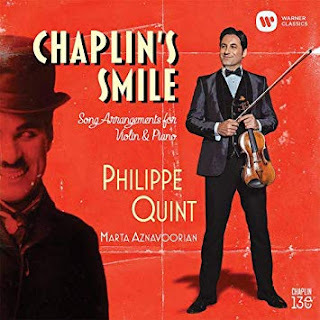 Thirteen Chaplin songs grace this collection, some perhaps you might recognize, others not, yet all brightly whimsical and in their own way melodically vibrant, all as on-the-surface casually brilliant as was Chaplin the comedic figure. Phillippe's violin work is beautifully agile and shows the dancingly Pop-accessible side of the era from which the music came. Marta is completely at ease and lucid in the context of this music and the two come across as artfully "artless" if that makes sense, just like Chaplin was in his many roles and films. Joshua Bell joins the pair with a bit of seconding for several of the songs and all that goes well, very well indeed. And on his own or net, Quint shows us a charmingly Gypsy-vernacular sort of expressive demeanor for the outing in ways that stand out. Any who love the art of the violin will find this one rather hard to resist, I would warrant. This in fact is at times rather Kreiserlesque as it strikes me--strongly accessible yet filled with the sort of brilliance it takes true talent and application to achieve. It is undoubtedly the case that much of the genius of Chaplin somehow translates into the musical idiom on these songs. The works have that humanity in them that Chaplin was so full of, always. And if these are straightforward tunes, that is consistent with his way, after all. It is music of cosmopolitan polish yet disarming in its thoroughgoing naivete. The man who brought us "Modern Times" perhaps endears in part in his refusal to be Modern in the capital /M/ sense. Admittedly there is a jazzy ragtime-y feel underlying much of this. Yet his art is a plea for a timelessness that in the end is also very much something to date him as of his time. Complex simplicity, this. And so this is the sort of music that might appeal to anybody and everybody. I cannot say it does not appeal to me! Recommended. Quint is a marvel. 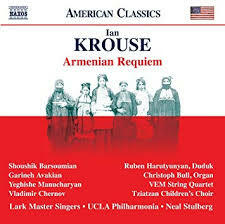 As a composer in the Naxos American Classics Series, Jan Klouse (b. 1956) comes center stage with his epic and dramatic Armenian Requiem (Naxos 8.559846-47 2-CDs). It is a work to meditate with solemn resolve on the centenary of the genocide of Armenians in 1915. It is music that comes out of the Requiem-specific Armenian liturgical chants, and does so with a spectacular assemblage of fine vocal soloists along with Ruben Harutyunyan on duduk, Jean Libdemann and Bobby Rodriguez on trumpets, Christoph Bull on organ, the VEM String Quartet, Tziatzan Children's Choir, the Lark Master Singers and the UCLA Philharmonia, all under the capable direction of Neal Stulberg. Such an ambitious gathering fills an hour-and-a-half of our time with a sprawling expression that goes back to classic sacred music oratorios surely, but too has a mindfulness of parallel Modernity in the landmark Passions of Penderecki and Part, and other advanced New Music expression, here tempered by an Armenian modality lurking in the shadows of the expressed, there without calling undue attention to itself. And then too there is Britten's War Requiem, which the Naxos cover info avows as an influence, an important one. To quote, Krouse was inspired by that work to fashion "a poignant meditation on loss couched in a marriage of Western and Armenian forms" to offer "both conciliation and hope." I concur that this is the case as I listen to the music with concentrated and increasingly sympathetic attention. The music is not precisely cutting edge not is it a backwards movement, yet if you set that concern aside you hear a veritable spring garden of musical delights, seriously miened, soberly comported yet hopeful, not without beauty and drama. It is a monumental endeavor that pays dividends by close listening. You might want to make this a part of your contemporary collection, especially you who want to enrich your experience of Sacred Music. By now we have to a greater or lesser extent had access to High Modernist music for around 100 years, if you start with Ives (say 1910) or Schoenberg (say 1920). It may not for the moment dominate the way it might have in the classic Darmstadt world of post WWII, but this no longer seems to matter for no one thing dominates any more. I like that. Nonetheless the High style continues to flourish and grow. Composer Samuel Andreyev gives us his take on it all with a nicely turned series of six chamber compositions on his recent Music with No Edges (Kairos 0015025KAJ). All enter into a rarified and abstracted world of rhythmically and harmonic-melodic further-leaning advancement. Nothing sounds folksy or strophic, then, and if there is a key center it is not an obvious one. And very happily, Maestro Andreyev excels wonderfully well in creating an ecstatic pointillistic counterpoint and extending it, the sort of thing you can hear iconically on "Le Marteau Sans Maitre" by Boulez, only brought forward into a different furtherance today. The liners to the album inform us that Andreyev is a poet as well as a composer and a You Tube channel host with more that 17,000 subscribers, and all the better for I do believe that one can only gain from stretching oneself in unlimited creative zones wherever possible so long as the focus remains in place. The works are of our time, literally, since they were written between 2004 and 2015. All have very contentful concentric girth. That is they show a thoughtful demeanor always. Nothing is casual so much as striving to encapsule the everyday if only to pierce through it to a deeper beyond? The works that feature four, five and six instrumentalists are to me the most fascinating and enthralling (comprising three of the six works here), partly because they are the most capable of the octopus-ian multi-strandedness that is what I most love about this music. And so if one wanted to get an immediate impression about what one will hear, one might start with the "Verifications" for piccolo, musette, A-flat piccolo clarinet, Casio SK-1, percussion and cello; the "Music with No Edges" for clarinet, percussion, viola, cello and double bass; and the "Strasbourg Quartet" for flute, clarinet, percussion and cello. Yet there is nothing lacking in the more intimate chamber works either. Samuel Andreyev shows his highly creative and inventive self throughout. This is New Music of true worth, in performances one can hail as paradigmatic. It is music that brings us into the future-present tense in happy ways. I strongly recommend this one. 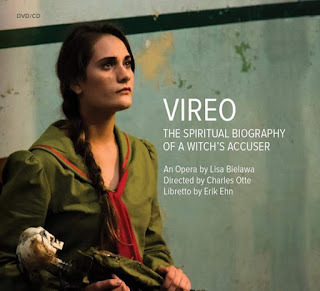 Of Lisa Bielawa's Opera Vireo (Orange Mountain Music 7017 2-CD&DVD) there is much to say. The way it is presented is innovative and very pleasing, and it frames in ideal terms the music, and the libretto by Erik Ehn. Note the subtitle The Spiritual Biography of A Witch's Accuser. The opera centers around the teen-aged young woman Vireo (played and sung beautifully by Rowen Sabala), who is subject to visions that the original French 16th-century socio-cultural setting defines and instantiates as witchcraft possession., and in her world she becomes a witch accuser. The world of Vireo is in constant flux. There are 12 chapters-scenes in all, and the time fluctuates from 16th Century France to the 19th Century, to the present day and temporal pockets in between. Vireo and in time her fellow accusatory companion Caroline (well sung and played by Emma MacKenzie) are responsible for numerous witch burnings, yet each chapter-scene is a shift in time and place into the present and the mythical past, so a boarding school, a convent, a farm and a dramatically central scene, when both are jailed in Alcatraz. The details of the scenes and plot are best digested via the DVD Video. The thread of all is Modern-Poetic-Hypersurreality. What is iconic and beautifully unforgettable comes about in part through the centrality of the film of the opera, shot on various sites as a film-music-drama more than a film of the staging. Music, cast, libretto by Ehn, screenplay, design and production by Charles Otte come together with an ever-shifting group of distinguished instrumentalists that includes the Kronos Quartet, the Prism Quartet, the San Francisco Girl's Chorus, Alarm Will Sound, the American Contemporary Music Ensemble (ACME) and etc. Singing casts and instrumentalists are integrated in each scene into a real-space site so we feel we are (and we are) watching a movie rather than a staging. This too allows for complete visualization of the dramatic time-shifts and dream-like world of the poetic irrational. The effect of the entire presentation, originally shown on PBS station KCET, is most remarkable, moving, the truly unified "total socio-artistic phenomenon" that melds all elements in a moving, ultra-memorable and unforgettable way. And happily it serves to underscore the musical excellence of it all as a performance and as a composition. The singing is exceptional, the performances plentifully right, just so, and we have in Vireo a triumph of the new Modernism with the best elements of the old Modernism transformed and reworked anew. Orchestration is seminal, the musical content ever-inventive, and in toto this is one of those breakthroughs that I do believe will be looked back at years ahead as a major new wonder, and that for its content and its presentation. It extends our idea of an opera without skimping on the musical and dramatic elements. You who seek to be in touch with the new will benefit greatly through experiencing, studying, entering the word of this wonderful work. It is hard to imagine a more riveting leading role than the one done so well by Rowen Sabala. Yet everything is exceptional and that is most rare! And in the end you wonder what it all means, how society creates frameworks, rather horrible ones most of the time, to accommodate a non-standard perception of the world. It is in the end disturbing, thought provoking. The witch accusers are the real witches, even more the institutions that recognize the defining realty of such things, and yet of course there is no such thing except in the collective consciousness, in our mythical illusions. All are victimized in the end? Yes, and we still suffer. Strongly recommended. What is worthwhile comes to us by directed chance. We cannot sample everything yet we choose much of what we find at critical junctures. So I did not simply find today's music, Elles (Atma Classique ACD2 2772) in my mailbox. I asked for it explicitly. And I am glad I did. 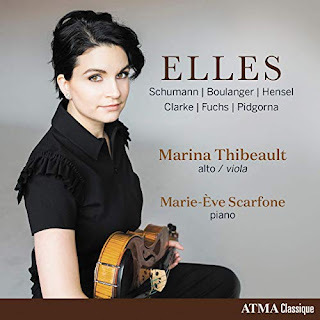 It features women composers, Romantic through Modern, with apt and fine-honed performances by Marina Thibeault on alto/viola and Marie-Eve Scarfone on the piano. What strikes me after quite a few listens is the poise of the artists. They give us a striking musical demeanor. The viola, much as I might love Leonid Kogan's ecstatic high notes on violin, has an alternate universe of burnished sounds in the somewhat lower register and I have a special love for that. Ms. Thibeault knows what she is about and takes perfect advantage of the inherent sound of the instrument to accentuate the musical possibilities suggested and prescribed by the composers on the program. And Ms. Scarfone responds with an equally burnished pianism that goes a long way to ensure an entranced listen. So the selection of works seems rather inspired. It begins with Clara Schumann's "Trois Romances, op. 22," a work of unabashed depth and piercing presence. Then the mood becomes ever more focused as we revel with Nadia Boulanger (1887-1979) and a starcasted viola version of her "Trois pieces pour violincello et piano." It is one of her most memorable chamber works and the version here is haunting. I find such programs well enhanced with the presence (as here) of something by Fanny Hensel (Mendelssohn), a touching nocturne based on Goethe's vision of nightfall. Goethe admired her music and she quite clearly appreciated his poetry. The last duet work is by a composer I have only come to appreciate in the last decade, Rebecca Clark (1886-1979). Her "Sonate pour alto et piano" is one of her classic pieces and the version here is as inspired as it deserves to be. Perhaps the highest point of the program occurs at the end, a leap into the modernity of the later then-as-now with two extended solo viola works played with a convincing fervor by Ms. Thibeault. The 1956 "Sonata Pastoral" composed by violist Lillian Fuchs (1901-1995) makes a lovely and gritty impression, which is then seconded by the living and thriving Anna Pidgorna and her "The Child, Bringer of Life." In the end I am left with a feeling that an important recital has been savored, that my appreciation for the viola and its deeply inimitable possibilities have been well realized with works by women I hear and learn from, revel in, that I bask within the hearing of same. Viva Marina Thibeault, viva Marie-Eve Scarfone, and viva Elles. Up for consideration is lyric Modernism by US Boomer (b. 1954) composer David Gompper. It is a disk that covers the Double Concerto "Dialogue" for violin, cello and orchestra (2012-16), Clarinet Concerto (2013-14) and Sunburst (2015) (Naxos 8.559835). The performances are stirring, featuring Wolfgang David on violin and Timothy Gill on cello for the Double Concerto, Michael Norsworthy on clarinet for the Clarinet Concerto, and the Royal Philharmonic Orchestra under Emmanuel Siffert for the whole of it. This is music that bustles and rustles more than bloops and bleeps, so in the rhythmic stylistic continuity sense has more in common with other American non-Serial Modernists like the "serious" Copland, Harris, (William) Schuman and the like more than Messiaen, Varese, Webern and such. That is not to say that Gompper's rhythmic aims are always straightforward, but nonetheless one takes in the give and take sequentially and intuitively with a forward arching. There are consecutive "ones," often enough regardless of what they add up to! There is pulse, regularity. And that what is not frequently mathematically obvious on the surface, so that gives it an American Modernity, surely. Melodically-harmonically the music is chromatic and tonal but at times quite expanded into near non-tonal paths. What strikes me listening to it all is orchestrational poignancy, syntactical fluidity and a clear and crisp vision of the soloists's interaction with orchestra that naturally follows the outcropping of Gompper's musical speech-logic. There is more performativity to the whole than virtuosity showcasing going on per se, though the expressive demands made upon the players, rather most strikingly the clarinet, cannot be ignored nor should they. 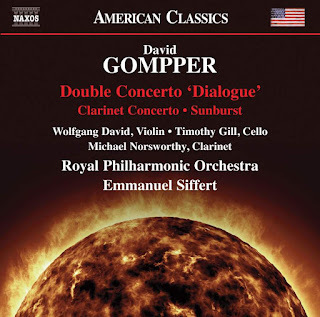 The Double Concerto has a very atmospherical, almost mystical cast to it and needs your concentrated attention perhaps more so that the Clarinet Concerto, which rivets your attention more directly with its exciting fireworks. Mr. Norsworthy's clarinet work is remarkable here and the entire work bristles with dazzle, then reflects with a sort of impassioned contemplation. Both this concerto and the following work Sunburst are based on sketches the composer set out that involved fractions that move in descending order. The latter work especially embodies "the proportional Farey series as plotted on a lattice," which is literally "sunburst" as a replicatable phenomenon? I have no exact idea but it does not matter for the moment. And it is in the hearing of results that all this takes of structure and converts it to expression as it must be in the performance arts. The work shimmers with magnificence, at times seems to extend from a Petrouchka/Rites nexus orchestralistically, yet so far beyond as to be of this moment and an originality that sets it very much apart. In the end the music is quite masterful. A world beyond unto itself, glistening and self-creating out of all we up to now have shared as part of the new. It is a High Modernism that does not look backwards as much as forwards, does not seek to create a stridency yet does not rest with the musical-chemical reactions of the simply earlier, for it is part of our "now-later" and in the best ways. Sunburst caps our program with something impossible to ignore, beautiful to hear, and cumulative in its complex being so that we gain all the more as we repeat the experience. It is music that asserts itself unflaggingly and originally. Reception is our part of the bargain, and the task must be taken seriously. This Gompper program is worth the effort, surely, but it does take effort to get inside this music. Once you do, you no doubt will feel rewarded as I do. It is music to dwell inside gladly. I recommend this one to your consideration with sincerity and with some conviction.